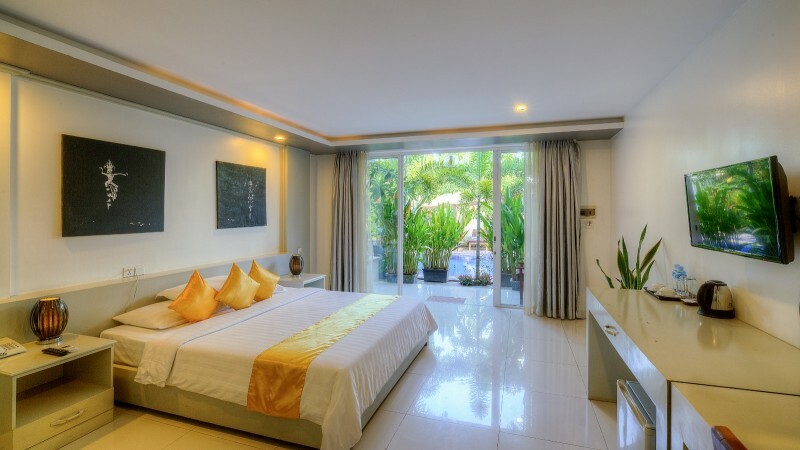 Strategically located in Siem Reap, Laysung Boutique Hotel offers modern and comfortable accommodations with free WiFi access in its public areas. It features an outdoor pool and provides complimentary airport pickup upon request. The property is just 0.7 mi from Royal Residence and 0.9 mi from the famous Pub Street. The UNESCO World Heritage Site of Angkor Wat is 3.9 mi away, while Siem Reap International Airport is accessible within a 5.6 mi drive. Offering pool views from the balcony, air-conditioned rooms come with tiled flooring, a wardrobe, in-room safe, seating area, a fridge and a flat-screen TV with cable channels. The private bathroom includes a bathtub, shower facility, bathrobes, and free toiletries. At Laysung Boutique Hotel guests may rent a bicycle/car to explore the area and visit nearby attractions. Friendly staff can assist with luggage storage, laundry and massage services. Free parking space is available for guests who drive. Enjoy alfresco dining at the in-house restaurant, where guests can sample a delectable spread of local dishes. Meals can also be served in the privacy of guests’ rooms. Menu introduces a wide range of cuisine from the house of Seasons ranging from Prime Cuts (Fresh & Frozen), Ready to Cook and Ready to Eat products. Each product is carefully prepared by our finest chefs using quality ingredients. Copyright © 2019 by Laysung Boutique Hotel, All rights reserved.